Android OS is becoming very popular for DIY enthusiasts looking to build their latest electronics project. 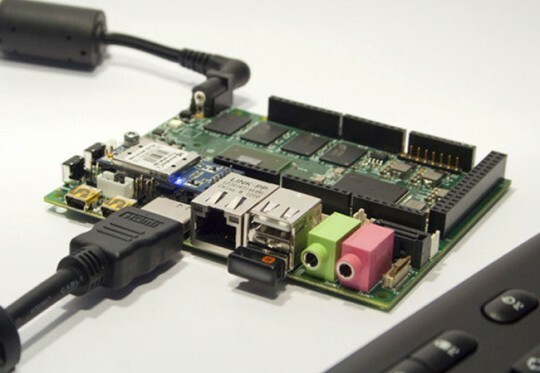 Many these projects involve little developer boards that put all the hardware and other connectivity options and features you need into one small footprint. Now a new device has come onto the scene that can run the Android OS called the UDOO Mini PC. UDOO is a cross between the Raspberry Pi and an Arduino board. The single board is Arduino-compatible and features a faster processor than the Raspberry Pi offers. The board supports both Android and Linux operating systems. The UDOO hardware features for the board include a Freescale i.MX6 ARM Cortex-A9 processor with 1 GB of RAM. The board will support any Arduino shields that are supported by the Arduino Due. The UDOO has a microSD card slot for storage, a gigabit ethernet port, integrated Wi-Fi, and audio output ports. It also features two USB ports, a pair of mini USB ports, and an HDMI output. The board measures 11 cm x 8.5 cm and a dual-core version is available for $109 with a quad-core version also featuring SATA connectivity available for $129. The project is currently on Kickstarter. To get all the latest phone reviews, news and features beamed straight to your Android device of choice, head to the Google Play store and download the free BeginnerTech Android app today or, click our icon below. To use the QR code you will a Barcode scanner, from the play store, then click the QR code.